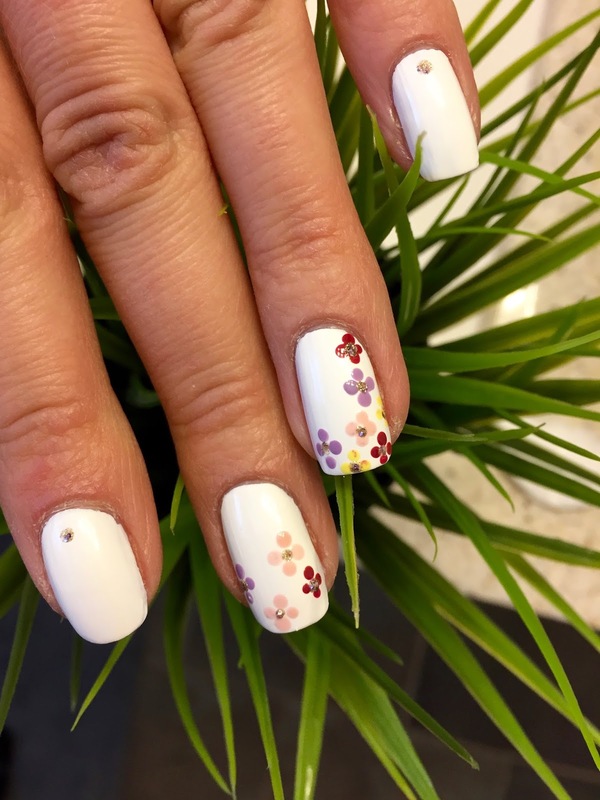 I have been busy lately and my go to nail design was plain color application. To say the truth I was even happy that my nails had time to dry before I smudge them, also fast dry top coat was very helpful. Nevertheless with Spring at our doors I felt like I need it to step up my game. Didn't come up with anything new yet, so just decided to recreate one of my favorite designs. 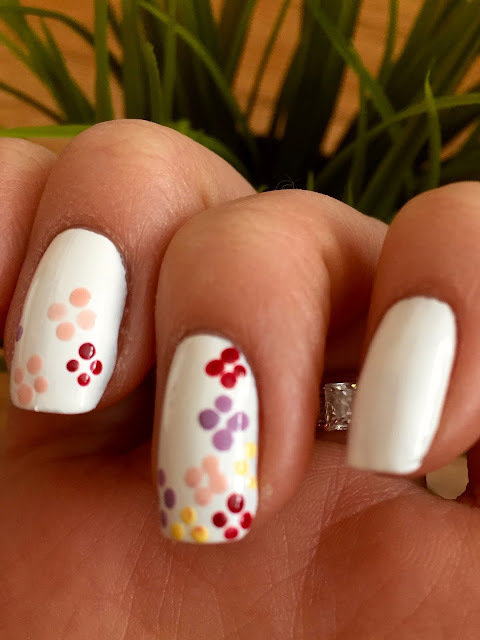 It's super easy to do, and you just need dotting tool and a few bright nail polishes. 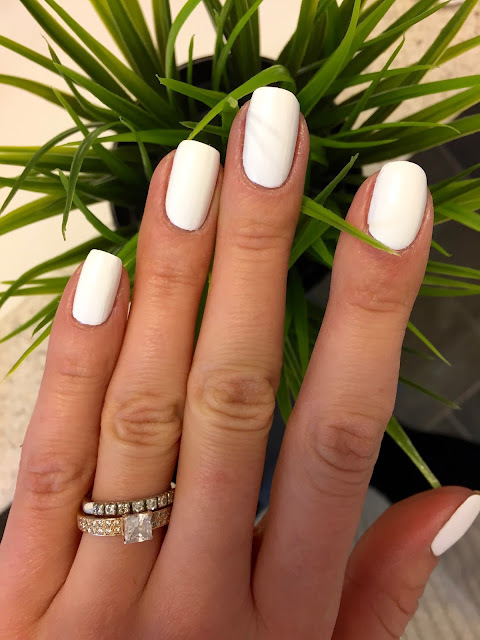 To achieve this nail design start with base coat and two coats of white nail polish. I used Alpine Snow by OPI. Use dotting tool (if you don't have one you can use toothpick or pan that doesn't write, you just need pointy end) to create flowers. 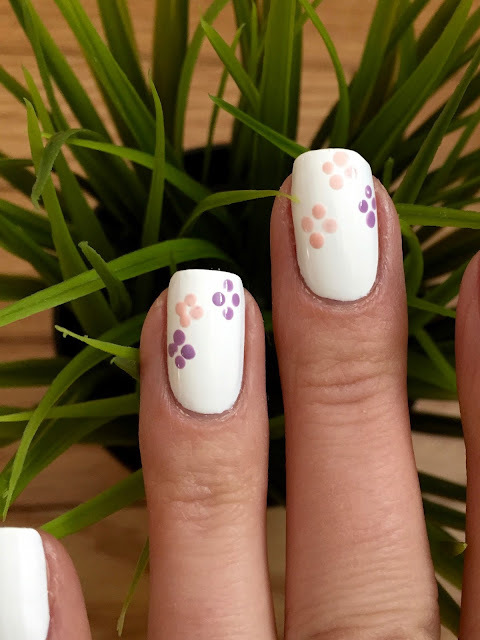 Dab dotting tool in a nail polish and put four dots, which will work as a petals for our flowers. I recommend applying the same color on every nail, and then come back with a new nail polish. Repeat the process. 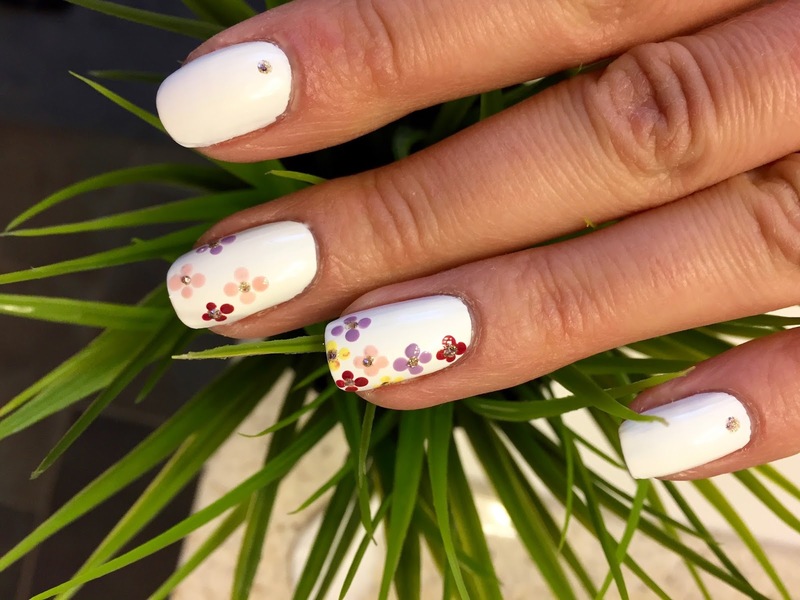 Spread your flowers chaotically all over the nails. On some nails I did more than on others. You can follow my design or be creative. I used four different nail polishes for the petals: purple, burgundy, blush and yellow. 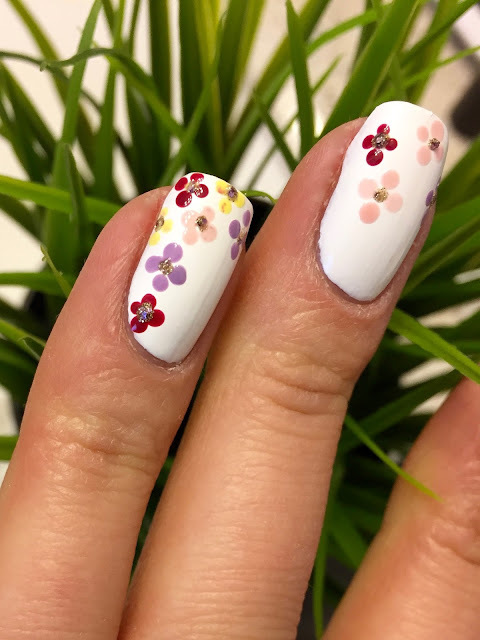 In the center of the flower put a dot, using glitter nail polish. I did flower design just on three fingers, on the other two I just put a glitter dot at the top of the nail. 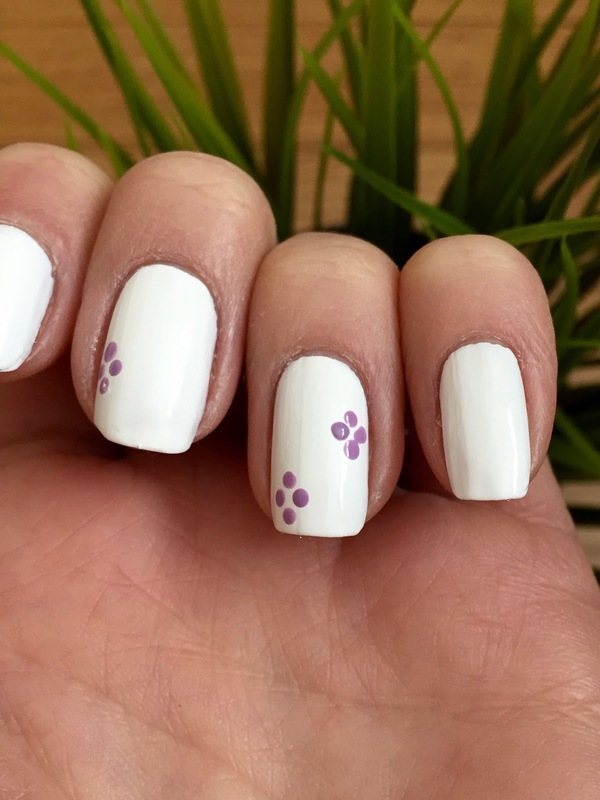 Wait for nails to dry completely before you apply top coat, otherwise it will get smudged. PS Excuse my dry skin and cuticle. Always had a problem with that. If you can recommend something, I will be grateful. I'm going to try really really hard to do this! I just loved how it turned out!